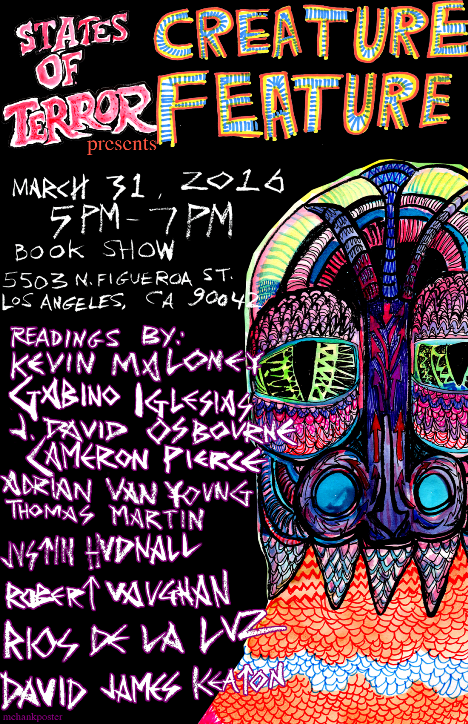 We are happy to announce that the lovely people at Book Show LA in Highland Park will be hosting us for a States of Terror reading as an AWP Los Angeles 2016 offsite event. In a celebration of the States of Terror anthology books, Book Show & Ayahuasca Publishing are hosting a reading of stories from the upcoming third volume! Featuring: Kevin Maloney, Lauren Becker, J David Osbourne, Andrea Kneeland, Adrian Van Young, Thomas Martin, Rios De La Luz, David James Keaton, Robert Vaughan & Justin Hudnall. There will also be copies of volume one & two for sale, refreshments, & more!